What do you do with a house full of teenagers while you're waiting for the frozen pizza to cook? The answer for us this weekend was make snowflakes. Friday night was one of those nights when the teenagers ended up at our house. The teenage dudes were playing video games while the daughter went off to the Winter Formal dance. Meanwhile, our older boys were playing different video games in another room. Around 10 pm teenage girls arrived at our house after the dance and they were ready for pizza. By 10pm on Friday night our kitchen was filled with kids ages 13 to 22 waiting for the frozen pizzas to cook. And then something interesting happened. The kitchen became quiet. If you have kids you know its not the screaming that you worry about, its the lack of sound. From start to finish the project took just about as much time as it took to cook the pizza. In the morning they woke up to Crystal Snowflakes. For me, it was a Christmas memory that I will cherish forever. The kids were unplugged and having a great time together. * Science notes: during this experiment they tried two different techniques to make the crystals. In one case they boiled the borax and then dipped the pipe cleaner stars into the mixture. In the other case they dipped the star into the boiling water and poured the borax powder over the star and continued with the experiment as indicated. 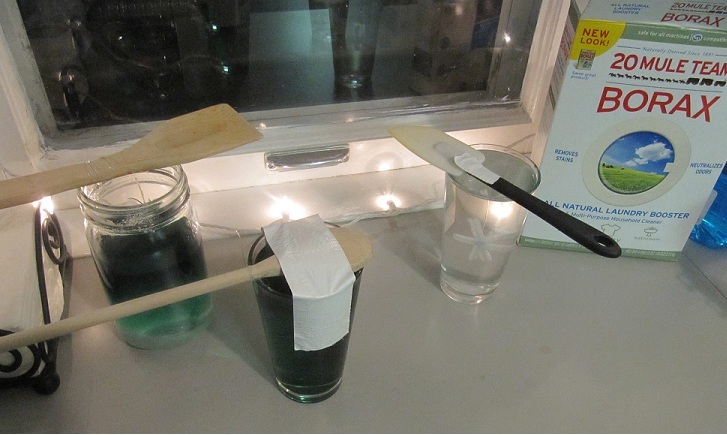 They made two stars in a green food color mixture and one without any coloring. They all turned out. The kids were concerned about how fragile the crystals were and we have dogs in the house so they did not want to hang them on the tree or anywhere the dogs might get to them. 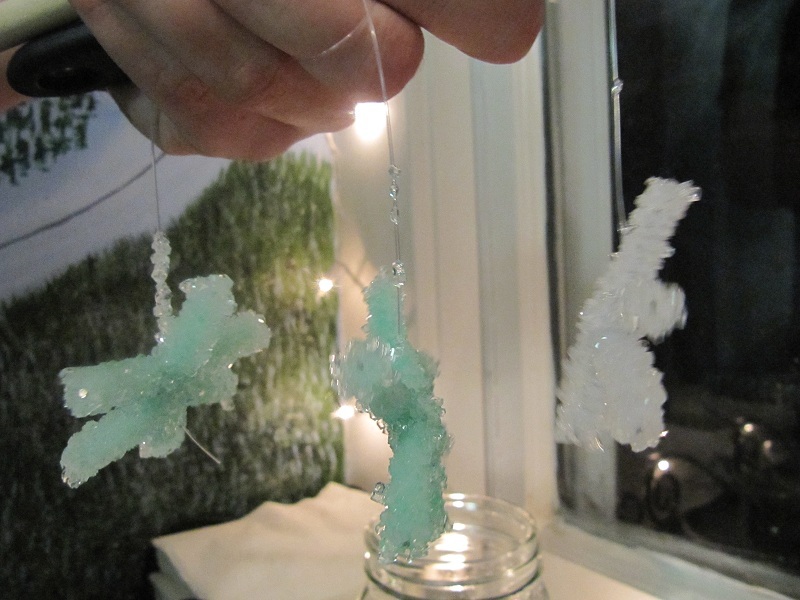 As they were hanging the stars in the kitchen window above the sink they dropped them and discovered that the crystals were much stronger than they had anticipated. It is also good to see that since this science experiment does involve using the stove and one of the ingredients is powdered borax bleach the final ingredient on the materials list is adult supervision. This project was such a hit at our house last night they have been inspired to try something new tonight. Not sure what they have in mind but the 20 year old just took off for the store to pick up bacon....? I'll have to let you know how that one goes. 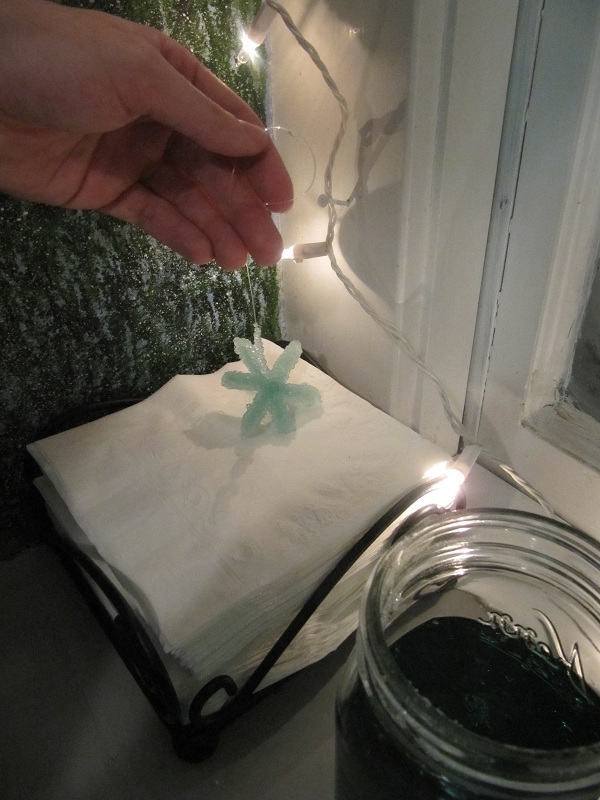 CLICK HERE to find out how to make your own Crystal Snowflakes and sign up for the Experiment of the week newsletter so that you don't miss out on any awesome ideas like this one. Mary - This is so great! I love that the 20 year old and the teens all got into making crystal snowflakes for Christmas. It shows kitchen science isn't just for kids.